Pittsworth Shire, an area of 1090 sq km generally 140 km south-west of central Brisbane, was amalgamated with Toowoomba City and six other shires in 2008 to form Toowoomba Regional Council. It includes foothills of the Dividing Range at Southbrook and extends westwards across the Darling Downs plains to Brookstead. The western boundary was the north branch of the Condamine River. Originally settled as the Beauaraba pastoral station, the Pittsworth area came under closer-settlement in the 1880s. A railway from Toowoomba to Beauaraba (later the town of Pittsworth) was opened in 1887, and extended westwards in 1911. Dairying was an important industry. 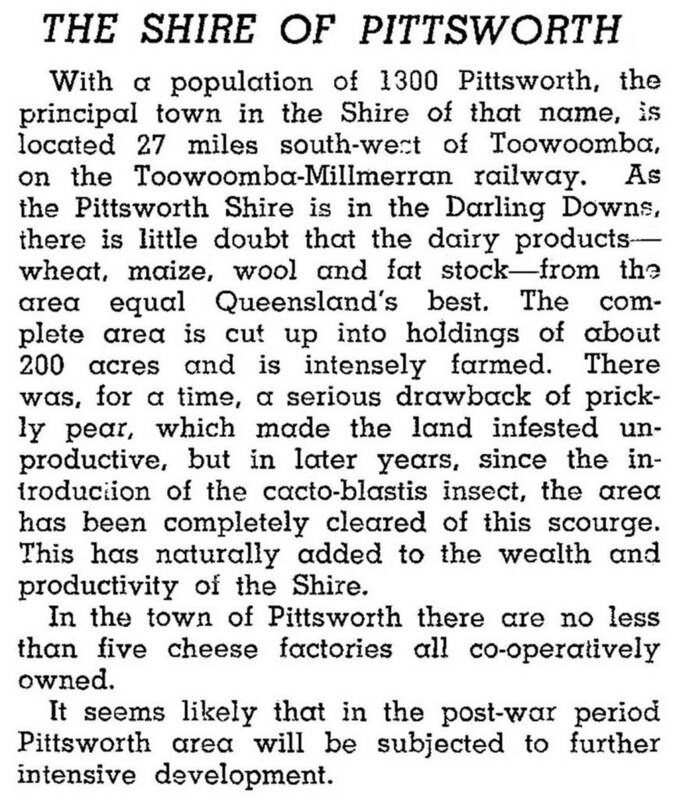 The Pittsworth Dairy Factory (1896) was a large cheese producer, and at various times there were four factories and several dairy herds of over 500 cows along the rail corridor to Brookstead. The only defect was prickly pear infestation west of Pittsworth in the 1920s and 1930s. Pittsworth Shire was formed in 1912 by excision from Jondaryan Shire. By then the dairy industry was well established and new settlements had formed. Southbrook and Brookstead, both on the railway line, opened schools in 1910 and 1915. Mt Tyson, on the northern boundary with Jondaryan shire, had a school opening in 1904. After World War II farmers turned to wheat, sorghum, barley and linseed growing. Sunflower, soybean and safflower followed in the 1960s. Beginning in 1953 bulk grain-storage sheds were built at several railway yards, the largest at Brookstead. From a population of about 3000 in 1913, the shire grew by small increments to over 3800 in 1961. The decline of dairying was less serious than in other places on the Downs. Grain and irrigated field crops enabled intense production to continue. In the 1990s the town of Pittsworth, 30-35 km from Toowoomba and its outskirts, was within a suitable commuting distance. The town also established an industrial estate. In 1993 Pittsworth shire had 15,500 beef cattle, 3850 dairy cattle, 4900 sheep and lambs and 17,400 pigs. They used just over half of the farm areas. Nearly 51,000 ha were used for field crops, mainly cereals.